The CJA In-District Advocacy Days are an opportunity to ensure members of Congress hear from and begin a conversation and consultation with frontline community leaders. 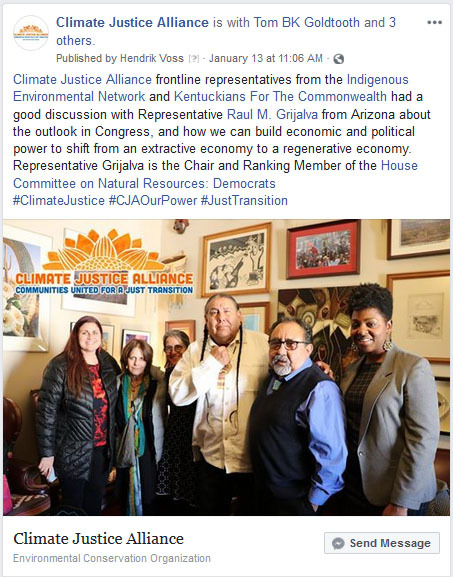 Face-to-Face meetings and building relationships with Members of Congress are critical in shifting the narrative and ensuring frontline community solutions are seen as viable pathways forward to the climate crisis. Use Facebook, Twitter, Instagram, YouTube etc. to amplify the work that you are doing during the CJA Advocacy Days and spread the word to your organization’s base, to your friends, family, and co-workers, as well as to your elected oﬃcials and the local media. Visuals are engaging. At the end of your meeting take a group photo with your Representative or their staff and share it on social media. You can also ask them to record a short video with you. You don’t have to be a professional videographer or even have a high end camera to record an effective social media video message with your Representative, a good cell phone camera recorded horizontally is all you need. 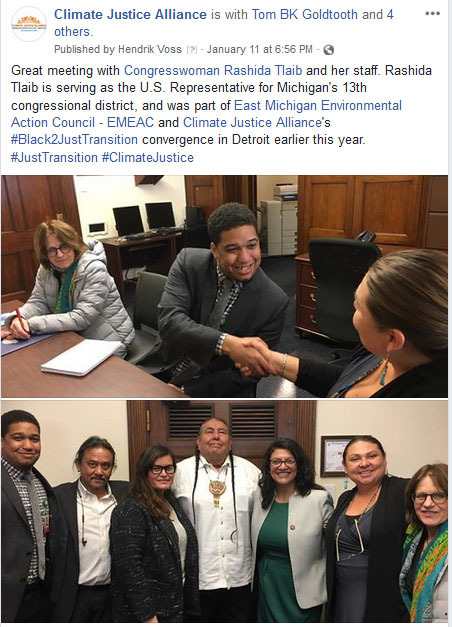 Ask them to say a bit about the importance of frontline communities and local groups in your community leading the way to solutions to climate change and environmental racism and inequality. 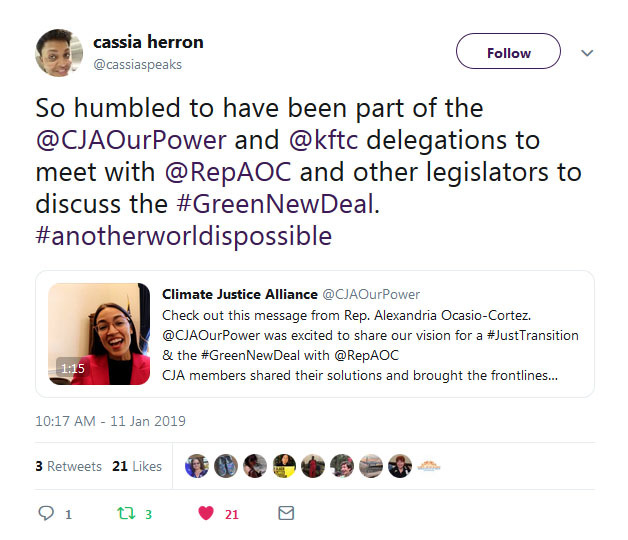 Make sure to to use the hashtags #CJAOurPower, #GreenNewDeal and #JustTransition and tag your legislators on Facebook. Use their official Twitter handles when you tweet to make sure they see your posts; twitter is the platform influencers use most! You can find a list of Twitter handles for members of the U.S. House of Representatives here. Ask for the contact information of the Communications aide in the Congressional office that you are visiting and follow up with a request to share or retweet your posts about your meeting. Members of Congress will appreciate being highlighted meeting with constituents over social media so ask them to amplify your posts! 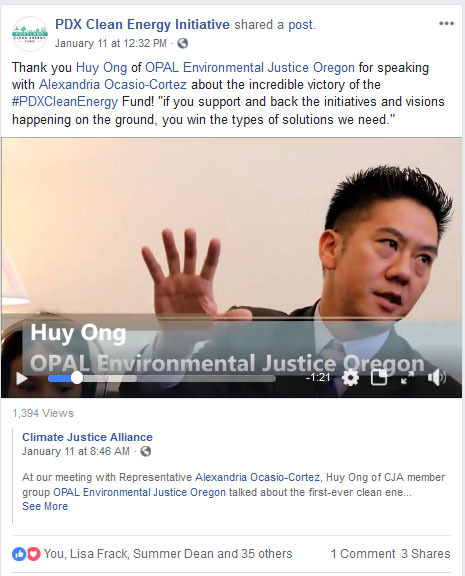 Congressional oﬃces are integrating social media tools into their operations to better understand constituents’ opinions. • Nearly two-thirds of Congressional staﬀ surveyed (64%) think Facebook is an important way to understand constituents’ views. •Nearly three-quarters (74%) think it is important for communicating their Member’s views. • 89% of reporters look to blogs and 65% are using social networks for stories. • Reporters will often turn to social media and dive into “hash tags” to ﬁnd quotes and real-time information on an issue or event. • Social media posts are a great way for them to ﬁnd leads and see emerging trends and topics develop. • Social platforms help them look for new sources or people who are actually at an event – and sometimes use photos or videos submitted.